Before 2017, Rowdy will be gunning for glory to make her UFC record 13-1! The news of Ronda Rousey returning to the ring is like music to her fans worldwide. Rowdy is more than ready to make her comeback to the Octagon at the Ultimate Fighting Championship (UFC) 207. The 29-year-old American MMA and Judoka ace will lock horns with Brazilian MMA fighter and reigning champion Amanda Nunes for the UFC Women’s Bantamweight Championship title. The UFC 207 main event bout is scheduled to take place at the iconic T-Mobile Arena in Las Vegas, Nevada on December 30, 2016. Rousey and Nunes will certainly aim for a KO as the Bantamweight title will be up for grabs. 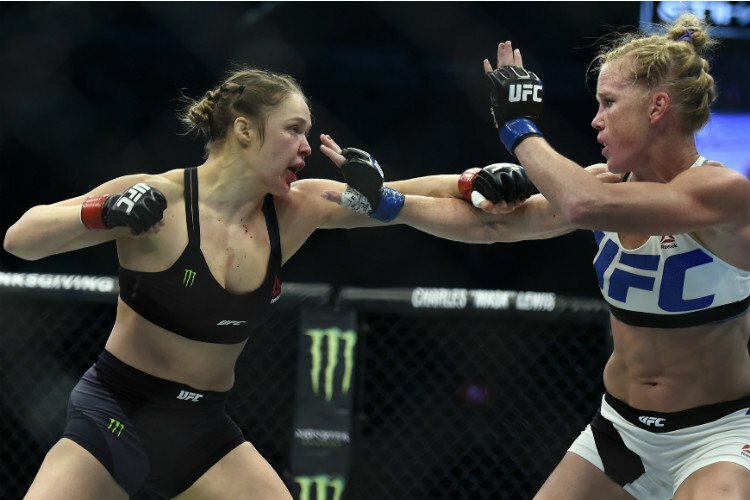 The reason for the worldwide hype around this duel is because of the fact that it will be Ronda Rousey’s first fight since her shocking defeat to British MMA ace Holly Holm at UFC 193 back in November 2015. Previous to that bout, Rowdy was the undisputed champion, due to being unbeaten in her 12 fights in the UFC. She had managed to hold her UFC Bantamweight title for reportedly 1074 days. ‘The Arm Collector’ who happens to be an expert at close-combat and a master at finishing her opponents either by knockout or submission, also admitted to having suicidal thoughts moments after being ousted by ‘The Preacher’s Daughter’. Rowdy was the first female fighter in the history of the sport to sign with UFC way back in November 2012. Fighting has always been in her blood, and thus it came as no surprise when she was practically the face of UFC at one point. But that all before she encountered the setback, her defeat completely shocked the entire UFC fraternity. People started to doubt her, critical analysis regarding her stance in the UFC started circulating the social media platforms as people started to wonder whether or not she will be able to be back to her best. One fight doesn’t make or break talents, it is the skills that ultimately does the talking. Rousey maintains her fitness by training with Gokor Chivichyan (Hayastan MMA Academy) and Edmond Tarverdyan (Glendale Fighting ClubWell) has made full recovery and will be gunning for glory. She is ready to silence her critics and prove her worth once again but is her preparations enough? Well, we will let champion Amanda Nunes will soon be the judge of that.